Join our PJammin® Day! Wear your PJs and help us put childhood cancer to sleep! Being a pediatric dental office, we’re all about fighting for the health of kids. That’s why we’re so excited to help fight cancer this month with the American Childhood Cancer Organization (ACCO), which works with children who are currently battling cancer. Our goal is to raise awareness for pediatric cancer and do our part to donate as well as collect donations, which will all aid in research of finding a cure for childhood cancer. Our patients are all children so this organization is truly close to our hearts. On September 12 we’re asking patients and parents to participate in our family friendly pajama day! We ask all patients, parents, and whoever else is coming to you child’s appointment to come and chill out in their PJ’s. For every child who rocks their pajamas at their appointment on September 12 we will donate $5.00 to the ACCO. Because pajamas are what these cancer stricken hospitalized children wear every day. They call it their warrior clothes and on September 12 we’d like to do what we can to be warriors for them. Children with cancer often spend months, even years, living in their pajamas at home or in the hospital as they undergo critical treatments such as chemotherapy, radiation, and surgery. During this time, they frequently miss school, time with siblings and friends, and other normal childhood activities. Instead, they rely solely on their family and medical team to help them through this difficult time in their lives. What If My Child Doesn’t Have an Appointment That Day? Don’t have an appointment that day? No problem! You can still participate by sharing a pajama picture with us on our Facebook page. For every Facebook photo we will donate $3.00 to the ACCO. What If I Would Also Like to Donate? Want to add an extra donation yourself? Great! Starting September 1st and ending September 30th we will be taking donations and 100% of the proceeds will go to the ACCO. Donations will be accepted in our dental office by cash or check as well as online via our donation page. We encourage you to write personalized checks as the ACCO will in return write you a personalized thank you letter! 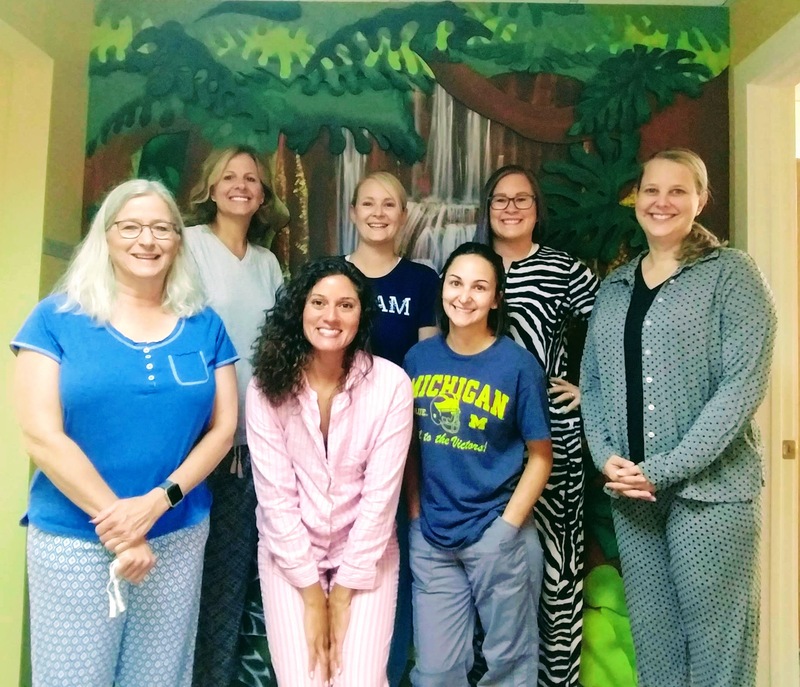 Patients and parents must wear family friendly pajamas to our office on September 12 or post on Facebook. For every child who wears pajamas to their appointment on September 12 we will donate $5.00. For every Facebook picture* this day we will donate $3.00. 100% of the proceeds go to the ACCO. Donations will be accepted in office (Cash or check) and via our acco.org donation page. Personalized checks are encouraged because the AACO writes them a thank you letter. *Limit 1 Facebook post per person. We are going to be taking donations from Sept 1 – Sept 30.